This is an interesting little item I tried at Wasabi during my last visit to Ottawa. I had never heard of this delicacy before and, according to Wikipedia, CNN Go rated it as number 32 on the list of world’s most delicious foods. Anyway, the liver I was served had a curious two-tone color, as you can see. I have noted this in a few other pictures (but not in all cases), and I wonder if this reflects different regions of the liver. Apparently, the organ is cleaned, rinsed with sake, and then rolled and steamed. 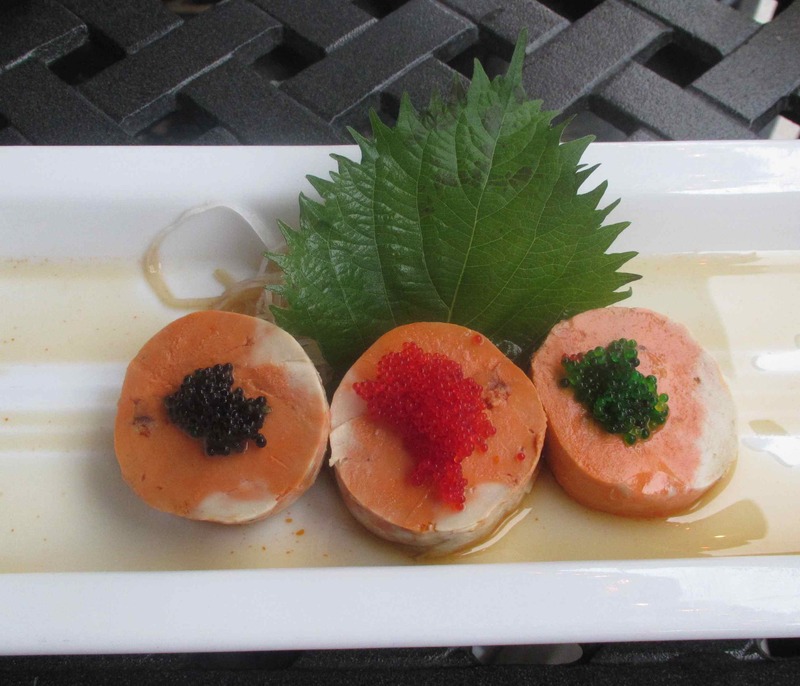 Ponzu sauce is typically served with it, as it was in my case, and caviar seems to be a popular garnish. Here there were red and black lumpfish caviar as well what I believe is ‘tobiko’ or flying fish roe (here dyed green). It makes for a pretty presentation although, on this occasion, I thought the choice of platter was a poor one. The monkfish liver I had at three Michelin starred RyuGin in Tokyo certainly ranked in my personal top 50, perhaps even as high as in my top 20. Although you are correct that it is not fattened, the taste did remind me a bit of foie gras. Perhaps it was prepared differently — it was simmered if I remember correctly. I must say that I do like liver, especially foie gras. I was very glad to have tried it… I’m not crazy about foie gras either but my wife likes it so I’ll usually sample some when she has it. I love shiso leaves. I could eat the leaves alone with a little bit of of ume plum.